As China’s policymakers mull the contents of the country’s next Five-Year Plan (2016-20), chinadialogue asks a range of contributors what they would like to see in the development blueprint. China’s 12th Five-Year Plan directed serious government attention to the improvement of flood-protection standards for large rivers and lakes, especially those with catchment areas bigger than 200 square kilometres. Over the past four years, the country has busily built embankments, levees and other river infrastructure, tightened flood measures and carried out projects to channel rivers. As a result, we have seen significant reduction of flood risk in regions including the middle and lower Yangtze River, the lower Yellow River and Dong Ting Lake. These are remarkable achievements. However, China has also suffered cases of severe surface-water flooding in major cities in recent years. Torrential rainstorms in Beijing in July 2012 killed 37 people, affected 60,000 more and inflicted costs of more than 10 billion yuan. 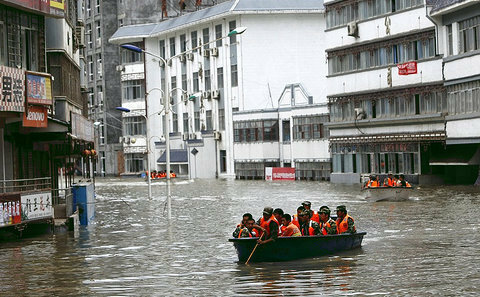 In October 2013, Typhoon Fitow brought severe flooding to eastern China’s Ningbo, where 460 millimetres of rain in 24 hours, compounded by storm surges, impacted 2.5 million people and tallied economic losses of more than 33.4 billion yuan. More recently, in May this year, intensive storms in the southern Chinese city of Shenzhen flooded more than 2,000 cars, inundated the main railway line from Hong Kong to Guangzhou and cost more than 80 billion yuan. A strong response to surface-water flooding in China’s urban centres is essential. Many Chinese cities urgently need improved drainage master plans, for example to strengthen storm-water drainage capacities, which are currently far too weak in most places. But drainage engineering works inevitably take time – and money – and will not solve the problem overnight. Therefore, we recommend that the government uses both “hard” and “soft” flood-risk management practices to better protect people and assets in China’s big cities. Soft measures include flood-risk mapping, warning systems, flood contingency planning and restrictions on new development in flood zones. They are cheaper than hard measures, and have proven effective in mitigating flood risk by encouraging communication with the public and citizen participation. The key is to let the public understand the flood risks they face, so that they can take measures to protect themselves – for example by carrying out flood-proofing works on their properties or deciding not to go to school or work on a particular day. In the upcoming 13th Five-Year Plan, we hope to see the government maintain its commitment to managing large river floods. However, the priority should be China’s increasingly populous cities, which are the financial, political and cultural heart of the country. The challenge is enormously high. Recent storms and cyclones show just how vulnerable these cities are. With large populations and valuable economic assets exposed to surface-water flooding, shifting the focus of China’s flood management roadmap to the city and district level is the right thing to do in the next five years. Faith Chan is an assistant professor, Department of Geographical Sciences, University of Nottingham, Ningbo China.